The last few days found us paddling Griggs Reservoir. This time of year we always hope that staying close to the shoreline will result in warbler sightings and perhaps a few pictures. With warblers and other migrants moving through it’s a good time of year. In recent days on the reservoir we’ve even seen Mink along the banks and while walking just south of the dam my wife caught the tail end of a Bald Eagle as it flew overhead. 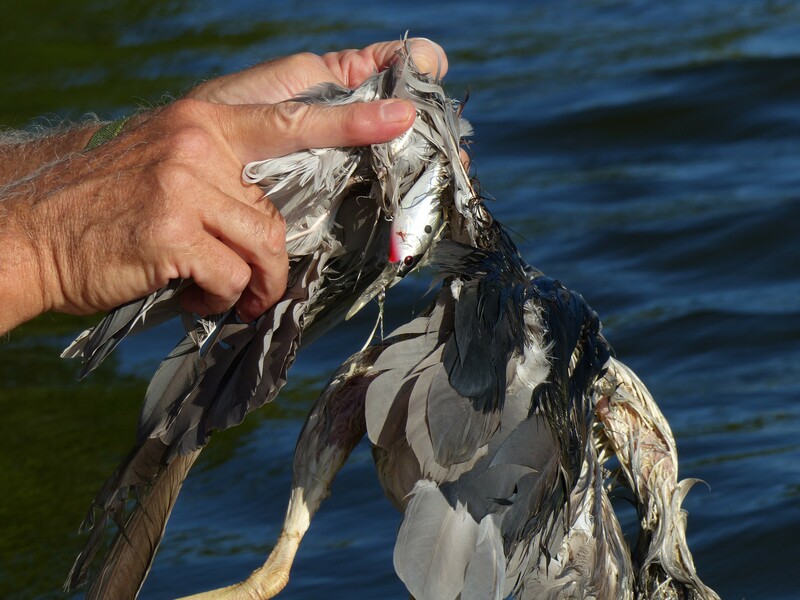 A number of immature Black-crowned Night Herons have also been seen, encouraging because of our recent discovery of one that had met it’s demise at the business end of a abandoned fishing line. 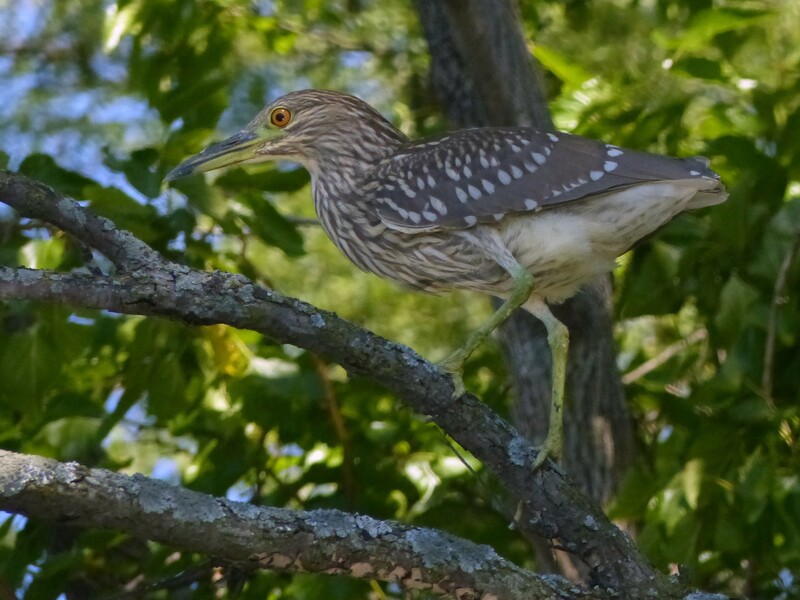 Immature Black-crowned Night Heron, Griggs Reservoir. 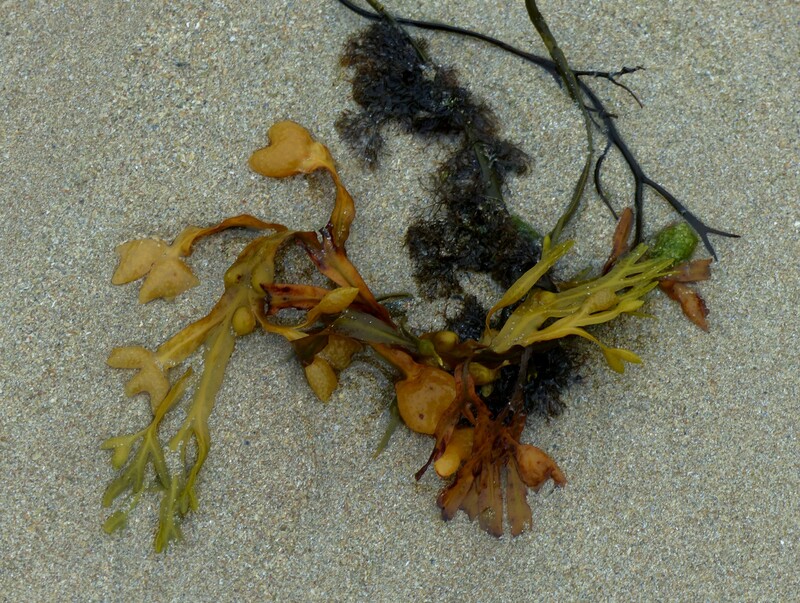 Other things were also seen as we made our way along the shore. 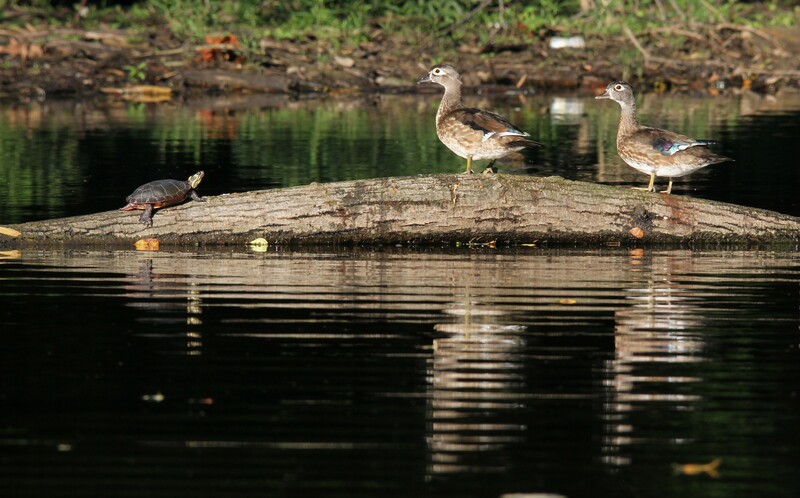 Two Wood Ducks seemingly amused by a Painted Turtle or is it the other way around, Griggs reservoir. 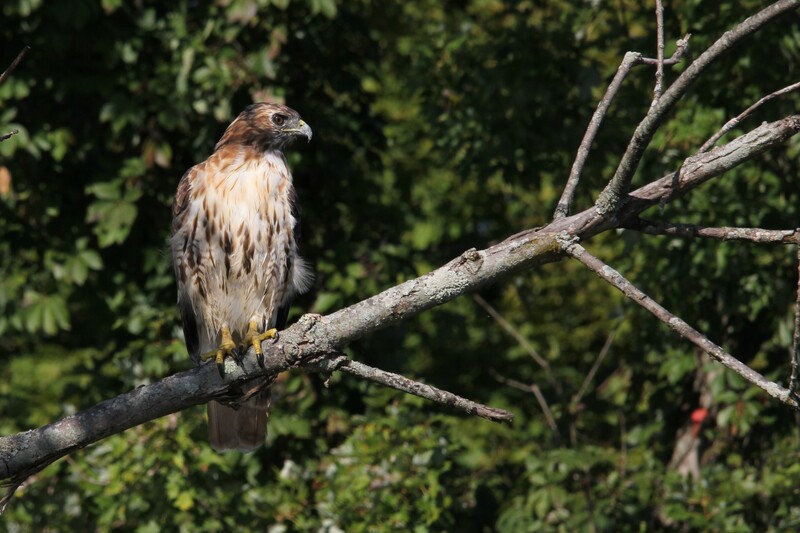 A Red-tailed Hawk looks on as we head north along the west shore of the reservoir. A female Kingfisher actually poses for the camera, Griggs Reservoir. Walking Griggs Park has been more productive for seeing as well as photographing warblers and other small birds mostly because of the difficulty in controlling and positioning the canoe in the pursuit of small active birds. A male Bluebird doing what bluebirds do best, Griggs Park. A male Cardinal, beautiful in the morning sun, Griggs Park. 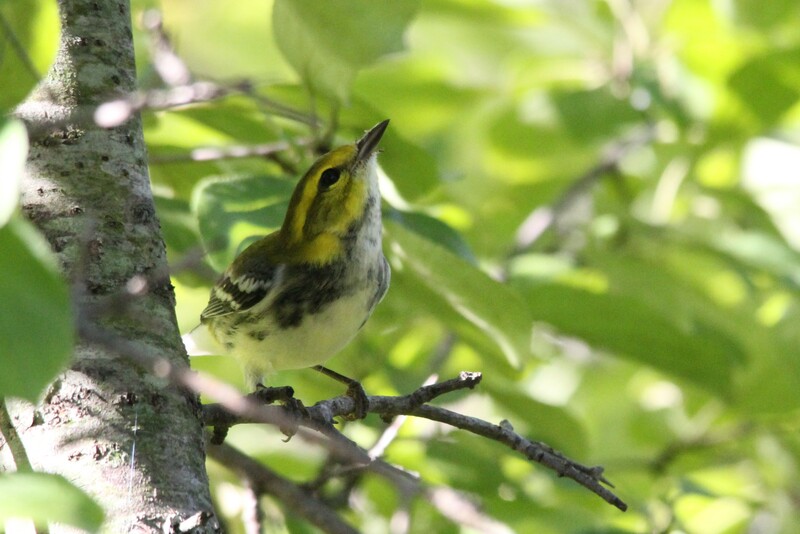 Black-throated Green Warbler, Griggs Park. 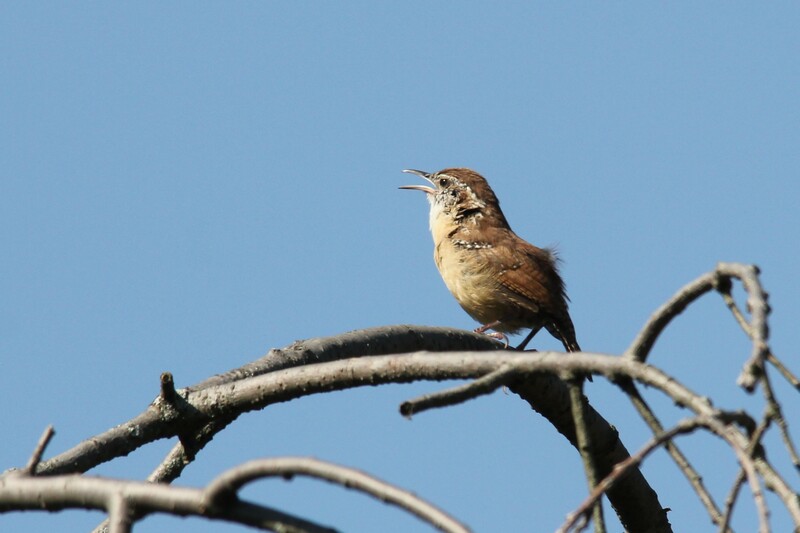 Carolina Wren sings it’s heart out. If the warblers aren’t cooperating there may be a butterfly, not always rare, but one we’ve not noticed before. Fishing is also getting better as the weather cools with time taken off between casts to do a little house keeping along the shore. What can I say, it’s always there, but as those who read this blog already know, it makes me feel better to pick it up. 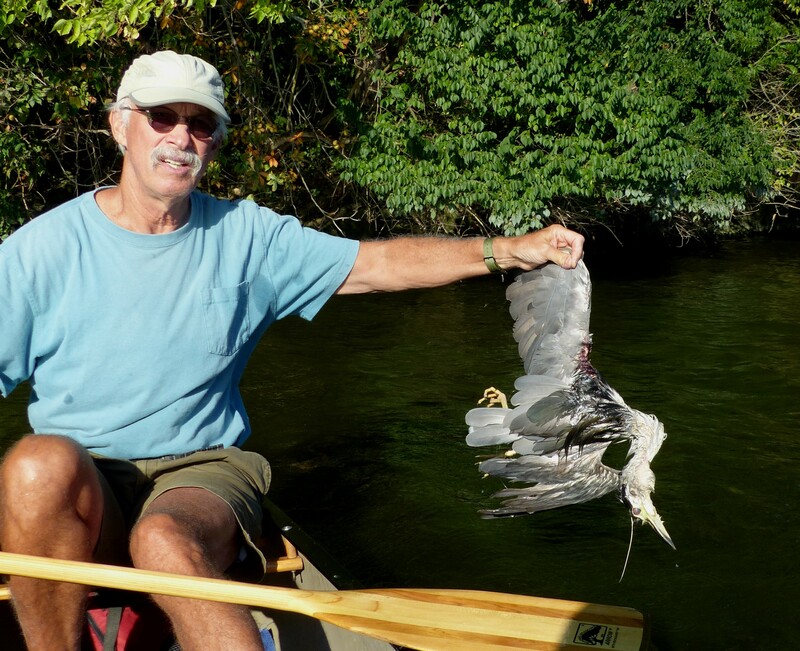 Unlike fish that are always returned to the water, the trash covering the bottom of the canoe is not “Catch and Release”! 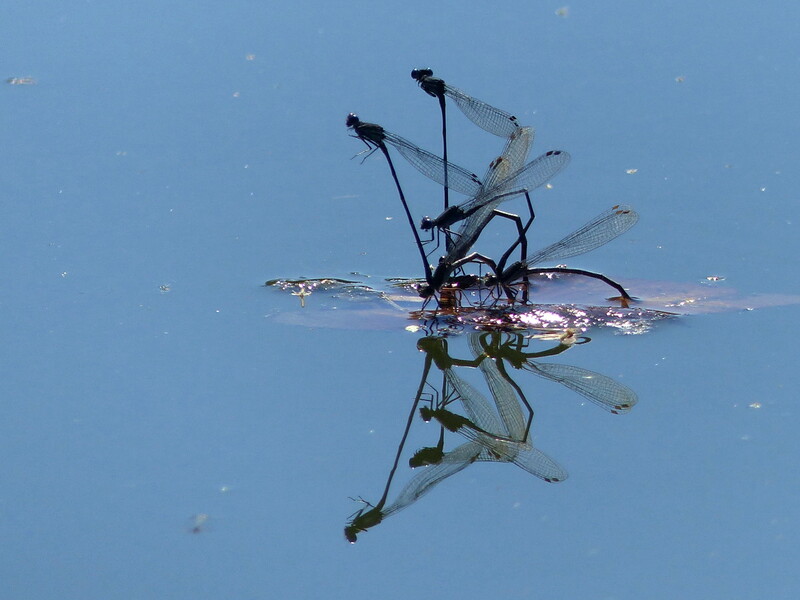 But recently real magic was discovered within the world of the very small when we spotted countless damselflies mating on fallen autumn leaves floating on the reservoir’s calm surface as we paddled back to our launch site during the warmth of the day. We’d never seen anything like that before. 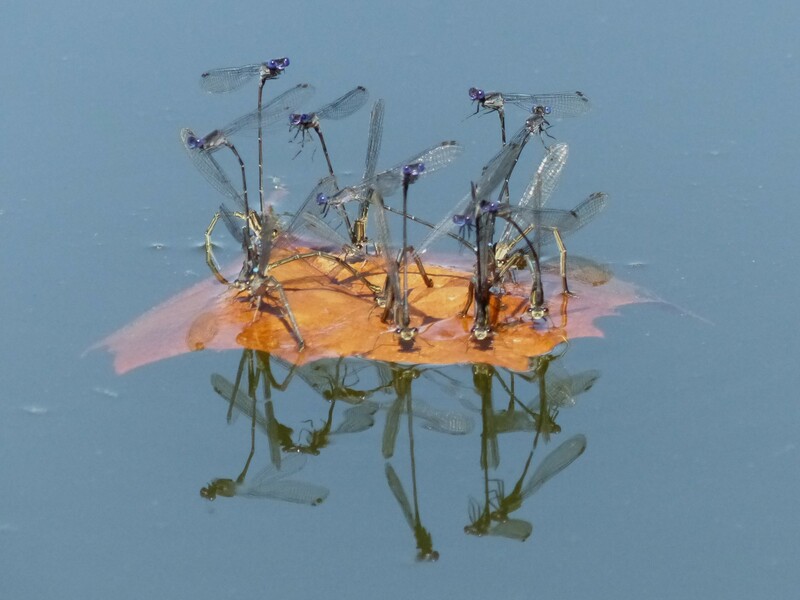 The bigger the leaf the more damselflies. 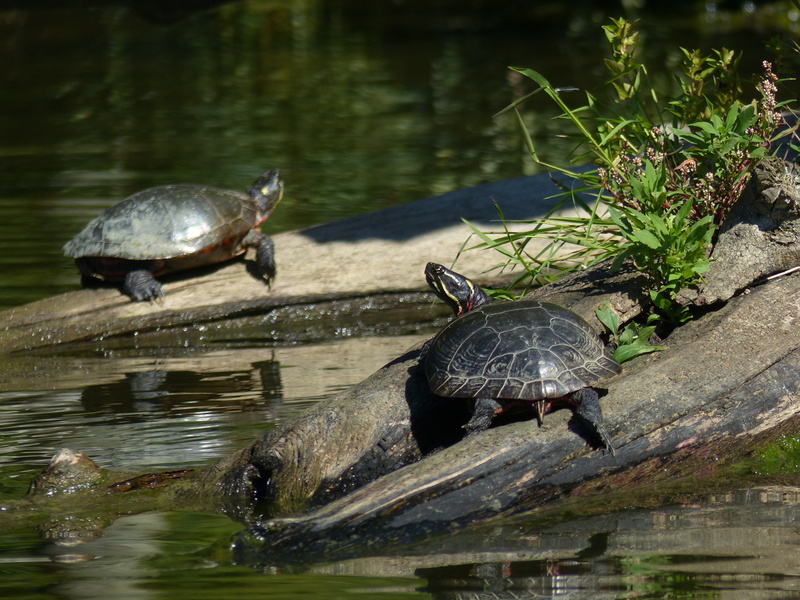 Sometimes, as we got close, they would swarm over the canoe. That’s about it for this post. 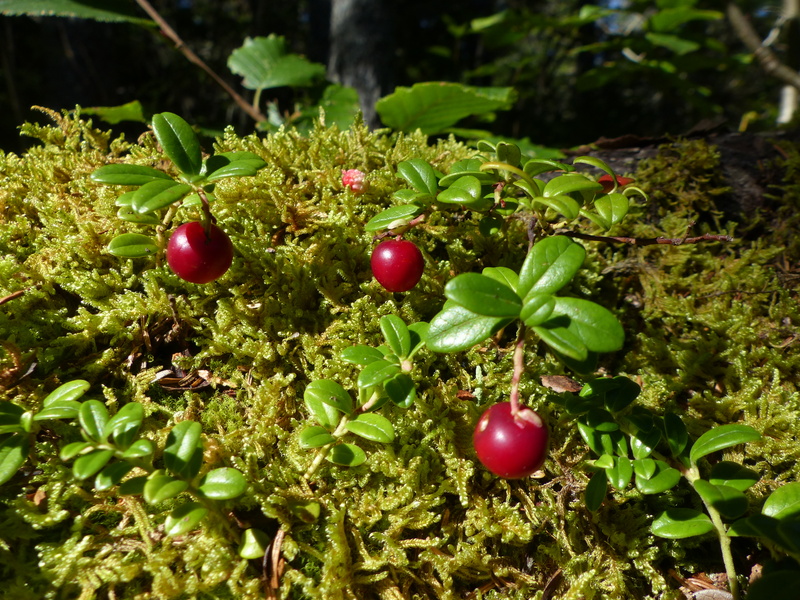 For us living in northern regions autumn is a great time to be out in nature. A feeling borne from the knowledge that this fleeting time will not last. Thanks for stopping by. Should you wish, various prints from this and other posts may be purchased at Purchase a Photo. and Donna’s 2017 Birds of Griggs Park calendar is available at Calendar. Every once in awhile we head off with friends to do some hiking. This year it was Acadia National Park in Maine. 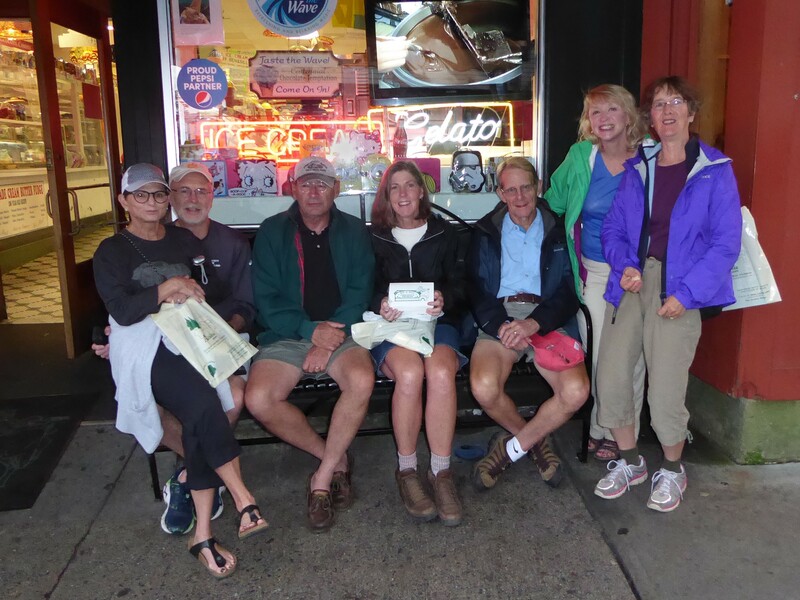 While there, our base of operation was Moseley Cottage Inn & Town Motel in Bar Harbor located easy walking distance to shops, restaurants and the harbor. We used the excellent free (donation requested) shuttle bus service to get around the island and access the trails. 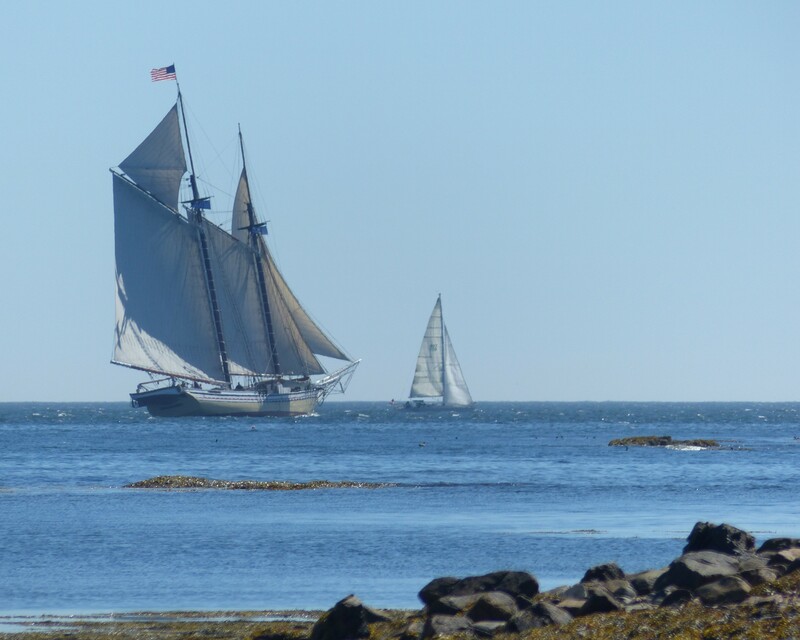 September is a great time to visit the coast of Maine with clearer cooler days and little fog. 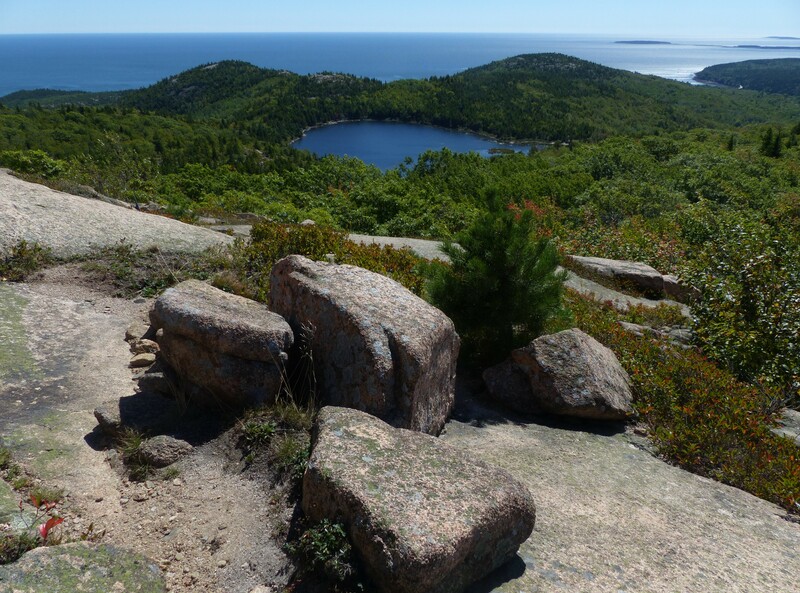 This is particularly important when hiking the rocky hills of Acadia which offer many unobstructed views of Frenchman’s Bay and the surrounding area. The first thing that impresses one is the rock. 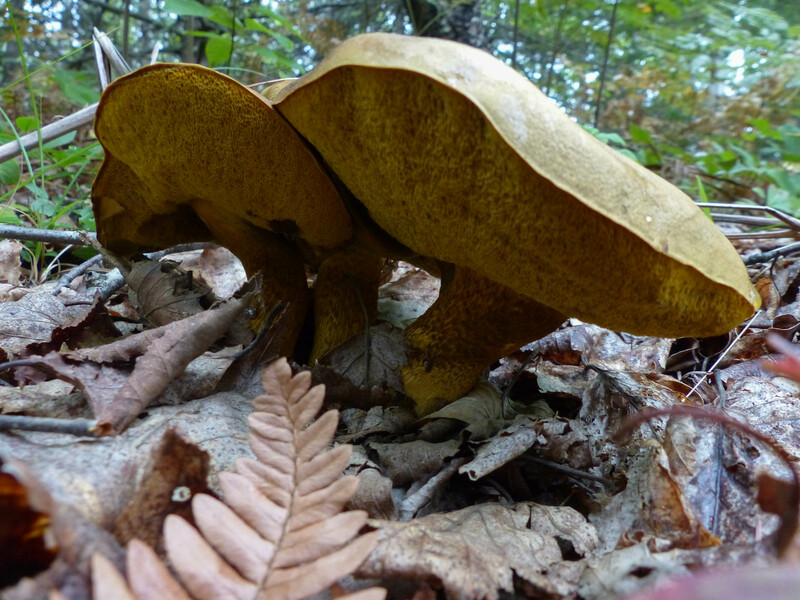 It’s some of the very oldest on the planet. 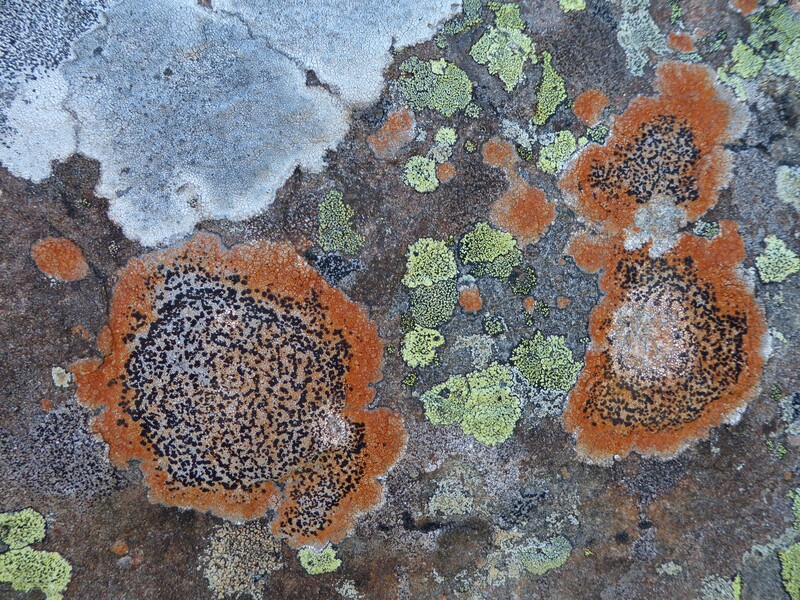 It’s weathered surface, in various forms, having stood exposed to the elements since the last ice age, is everywhere. In fact the last ice age is why the area with it’s barren hills, deep clear lakes, islands, and rugged coastline looks the way it does. 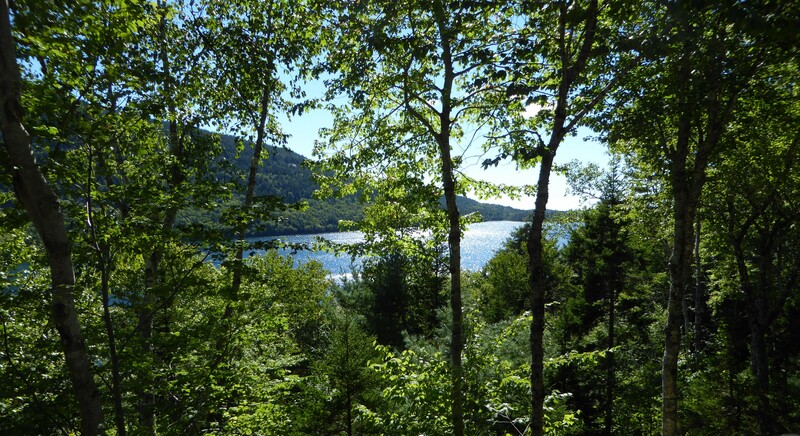 Looking towards Frenchman’s Bay, Acadia National Park. 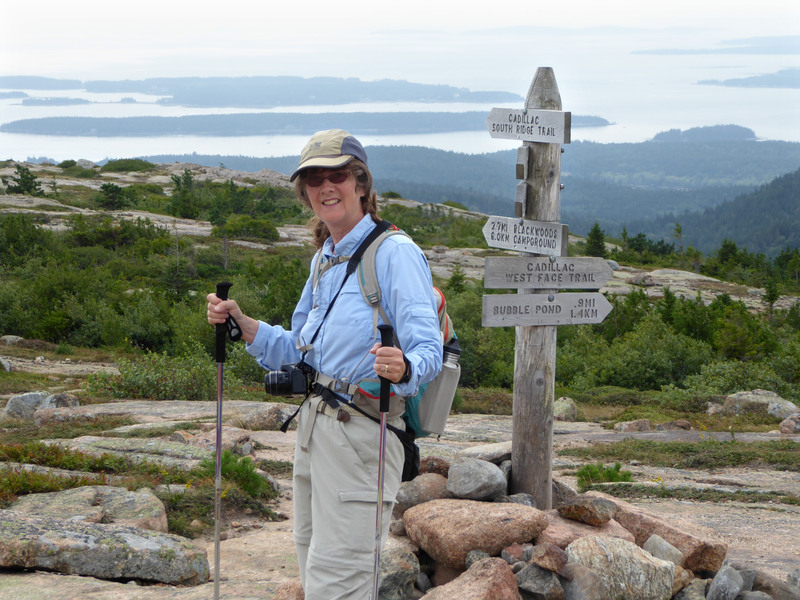 On the Cadillac Mt South Ridge Trail, Acadia Natl. Park. 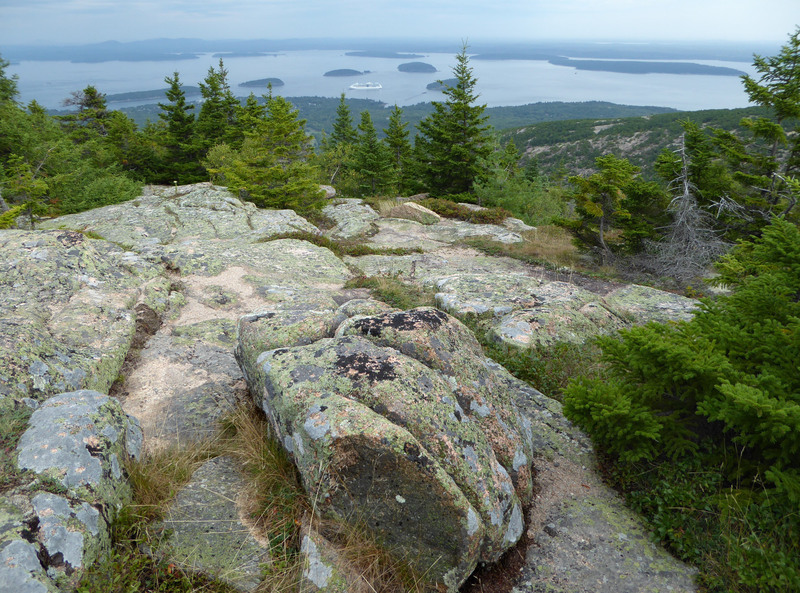 Looking down at The Bowl from the Champlain Mt trail, Acadia Natl Park. 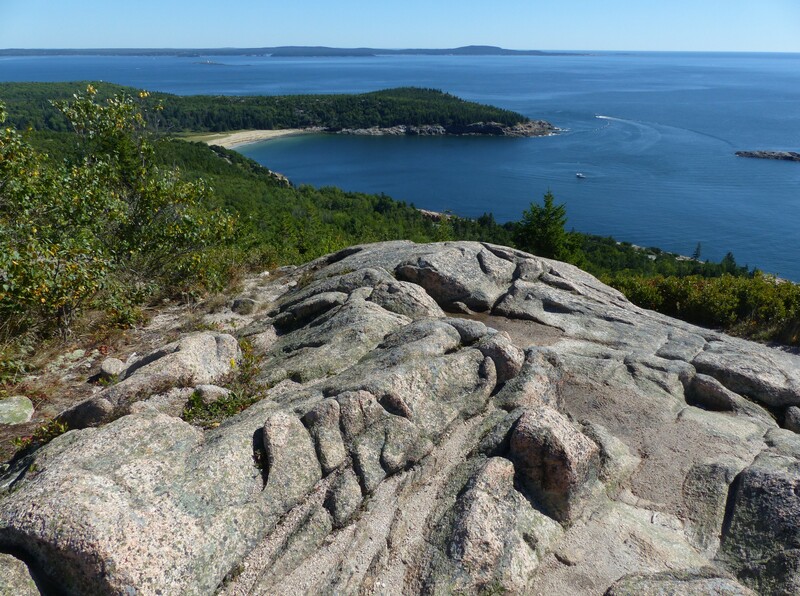 The Bowl, Acadia Natl Park. 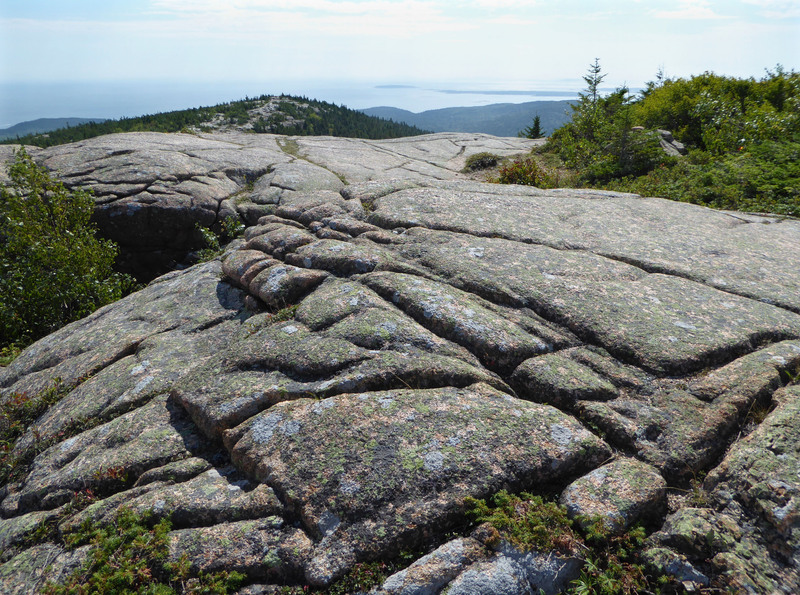 Glacial erratic’s, Acadia Natl Park. In the distance Sand Beach and Great Head, Acadia Natl Park. 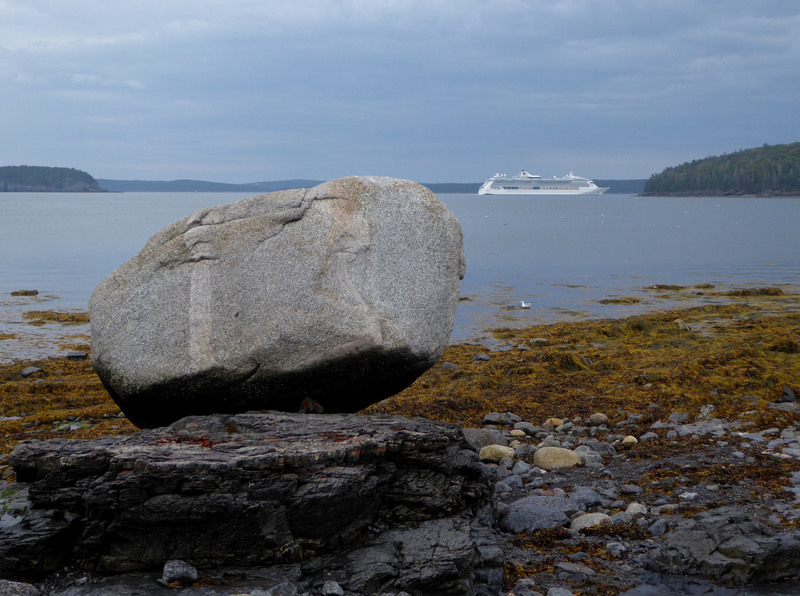 A Glacial erratic seemingly dwarfs a large cruise ship as it leaves Bar Harbor. 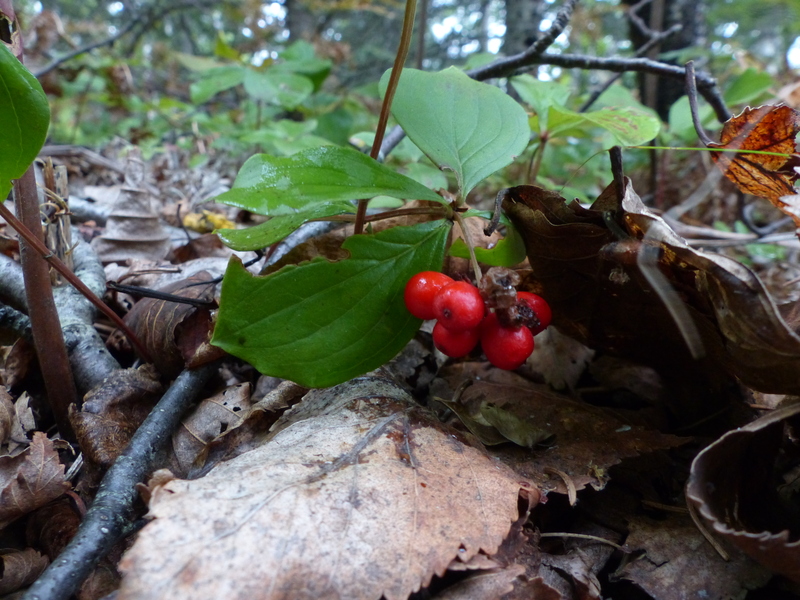 Hiking on the Maine Coast rock blurs one’s concept of time. In “rock years” the span of my life was of no more consequence than my next step. The rock doesn’t care. For a time while on the trail, I tried to fathom it all, walking mindfully, no longer “falling” from one foot to the other, but slower, placing each step, feeling muscles work, attention to each breath, balance, and control, giving thanks for this moment in time and place. 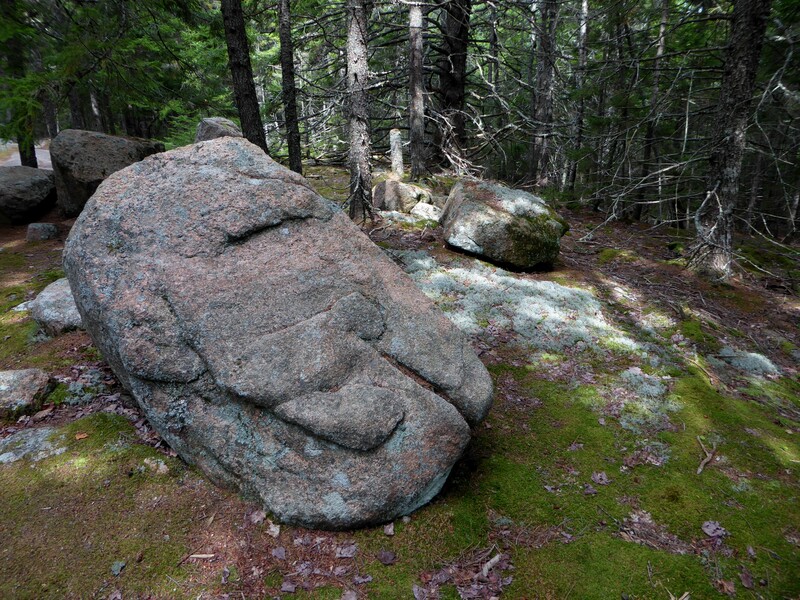 Sculpture in rock, high above Frenchman’s Bay, Acadia Natl Park. 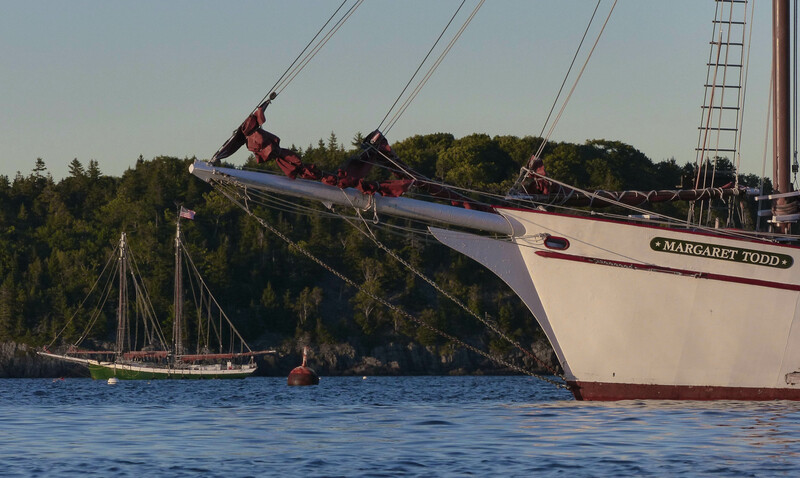 Cruise ship, Bar Harbor, Acadia Natl Park. 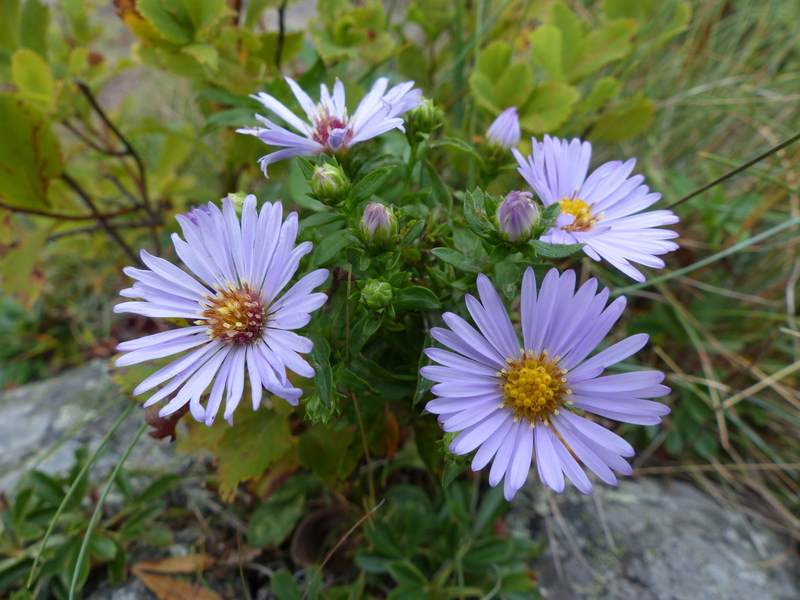 But there is a lot more than rocks and one of the first things noticed walking one of the park’s many excellent trails, are the wildflowers. However, before a hike is undertaken, care should be used in the selection because the level of difficulty ranges from very easy to extremely difficult. 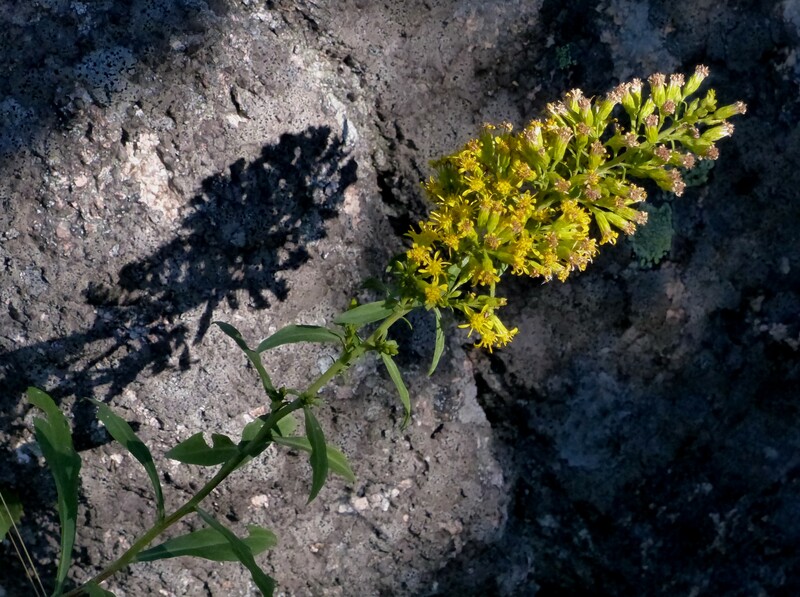 Goldenrod and granite, Acadia Natl Park. 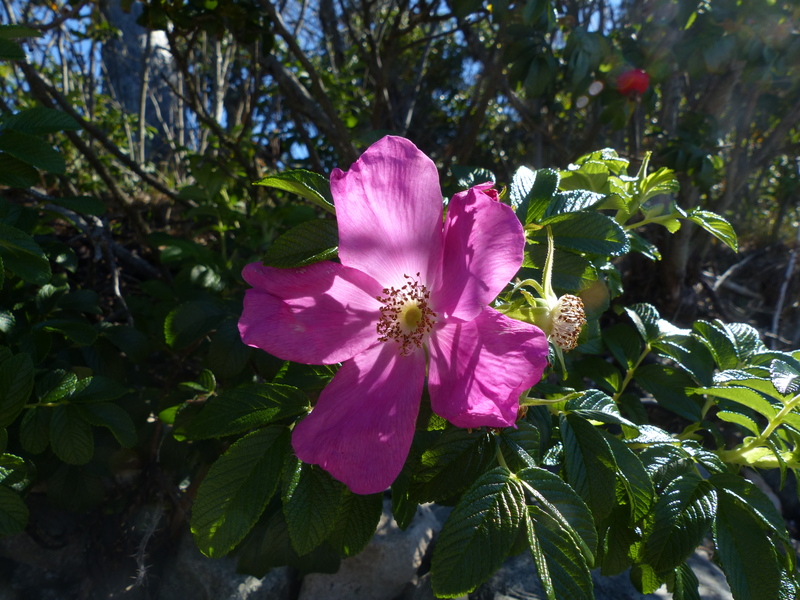 Rose Hip flower, Acadia Natl Park. 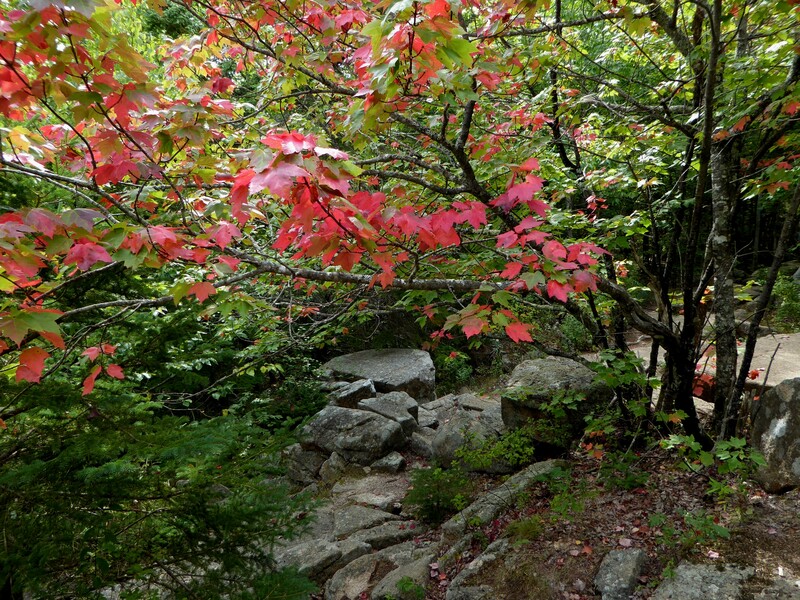 Early fall color along the trail, Acadia Natl Park. Looking a little closer, when not negotiating one of the steeper more challenging stretches, lichen and fungi were also seen. 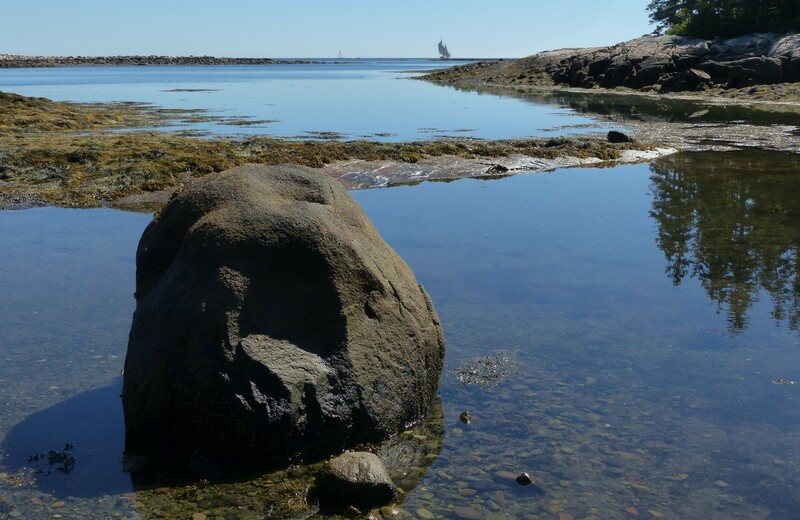 Some trails such as Wonderland and Ship Harbor took us right along the rocky coast with tide pools to explore. 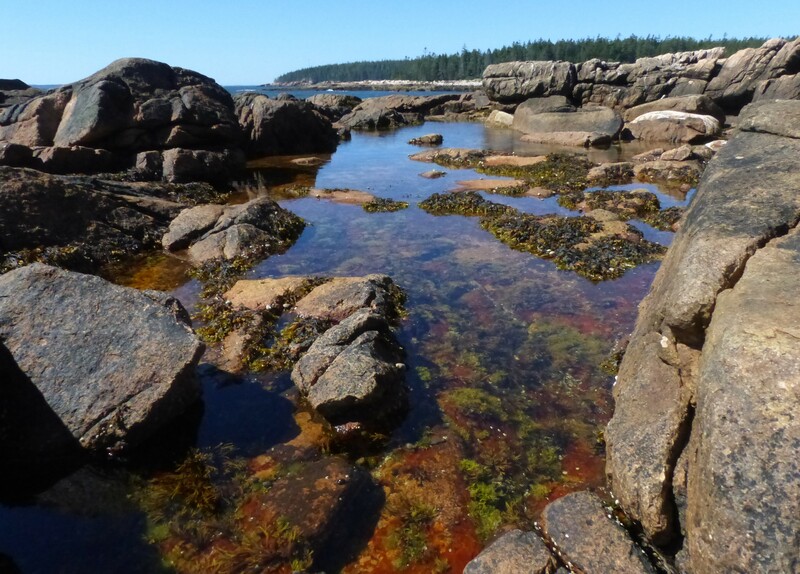 Tide pool 1, Ship Harbor Nature Trail, Acadia Natl Park. 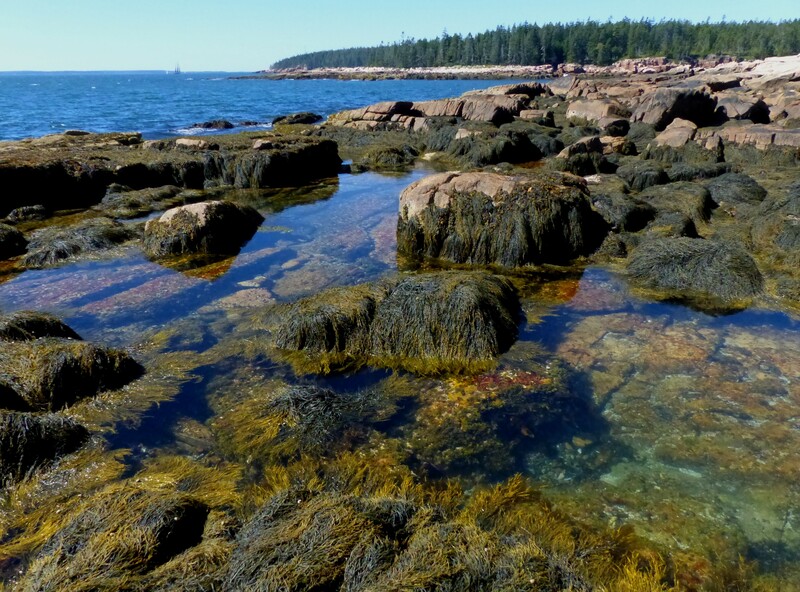 Tide pool 2, Ship Harbor Nature Trail, Acadia Natl Park. 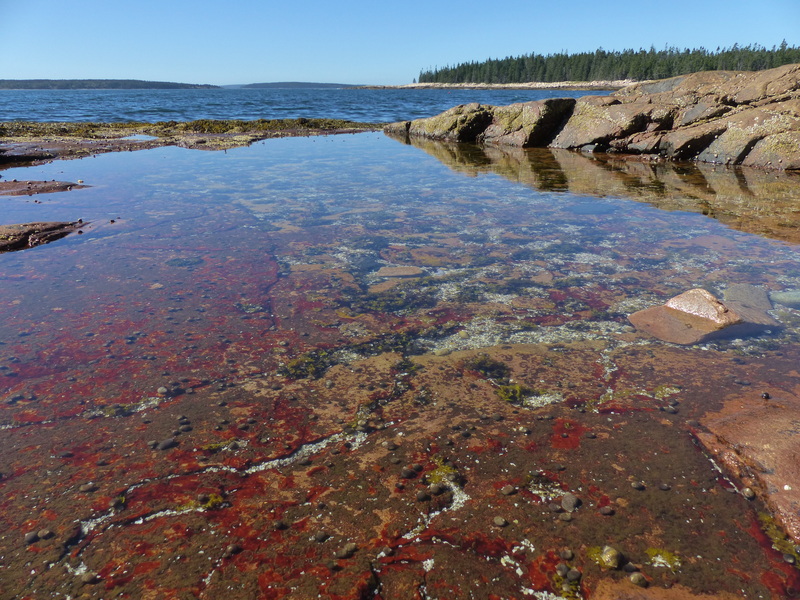 Tide pool 3, Ship Harbor Nature Trail, Acadia Natl Park. 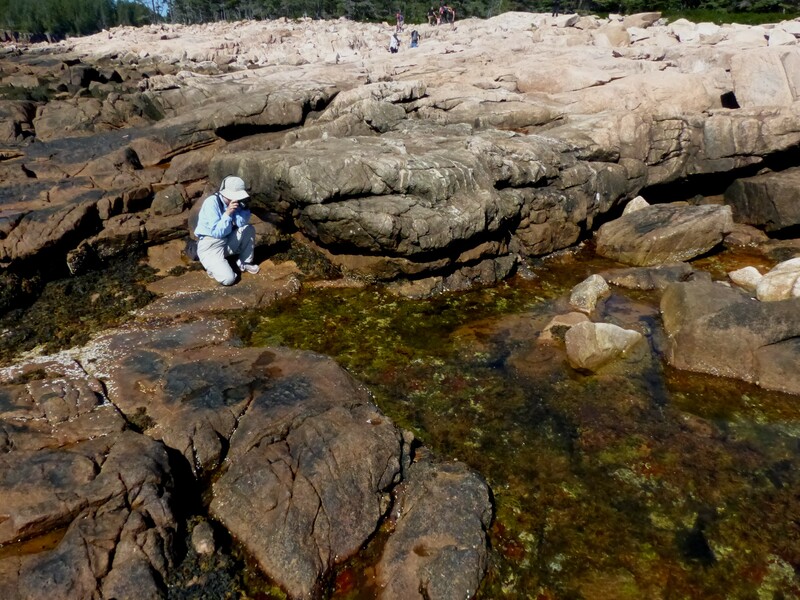 Exploring a tide pool, Ship Harbor Nature Trail, Acadia Natl Park. 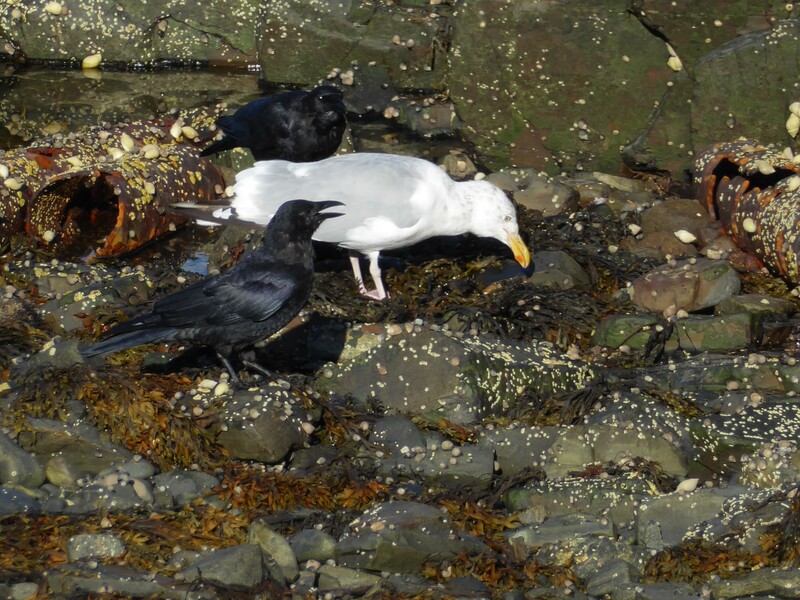 Hiking with friends was the primary objective but near the ocean we were fortunate to see a few birds. Fish Crows wait to help out. Shadow Darner, a first for Donna, Cadillac Mt South Ridge Trail, Acadia Natl. Park. 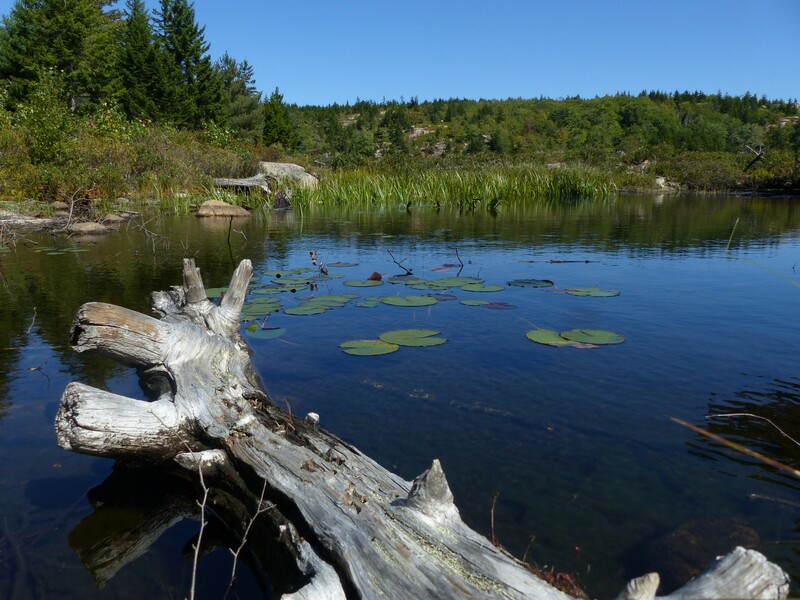 A hike around Jordan Pond was also on the week’s menu or was it the popovers at Jordan Pond House and then the hike? I’ll never tell. Jordan Pond through the trees, Acadia Natl park. 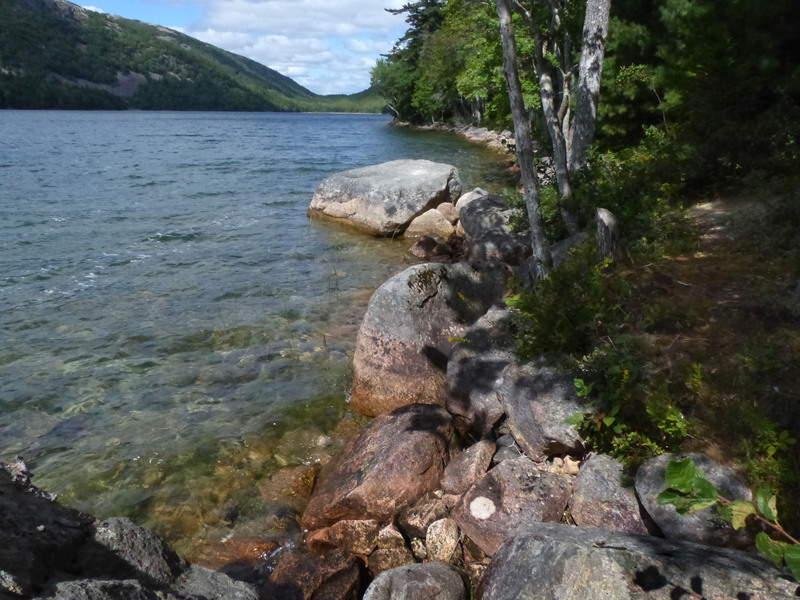 Jordan pond trail, Acadia Natl Park. 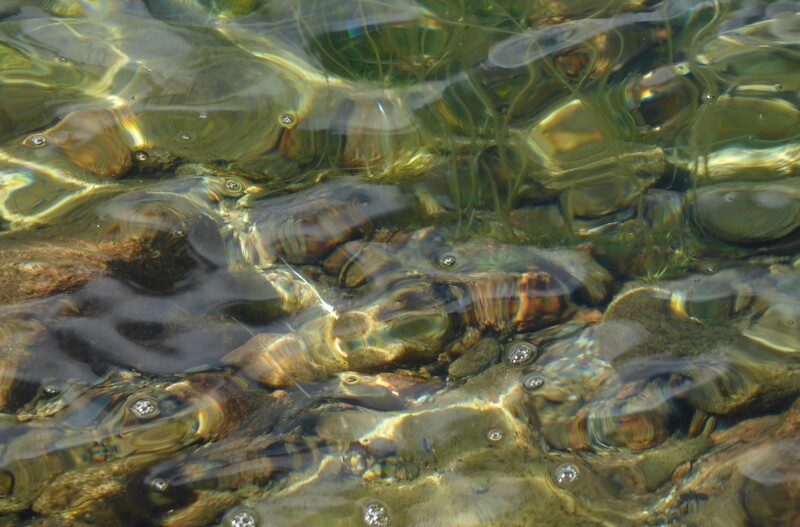 Crystal clear water, Jordan Pond, Acadia Natl Park. Pausing for a moment at waters edge we listened and looked. The sun did it’s best to warm the late summer day as a cool lake breeze rustled the overhead leaves. 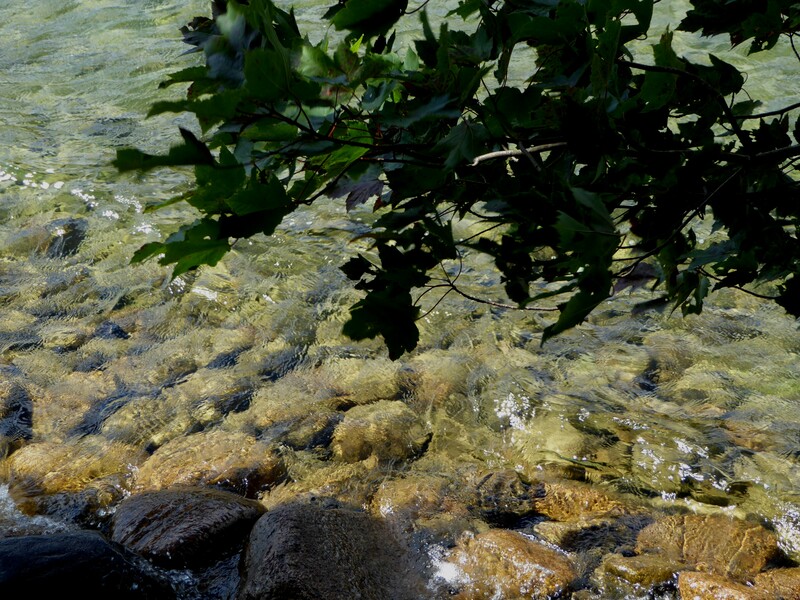 The sound of gentle waves playing against the shore as patterns of light danced on the rocks below. 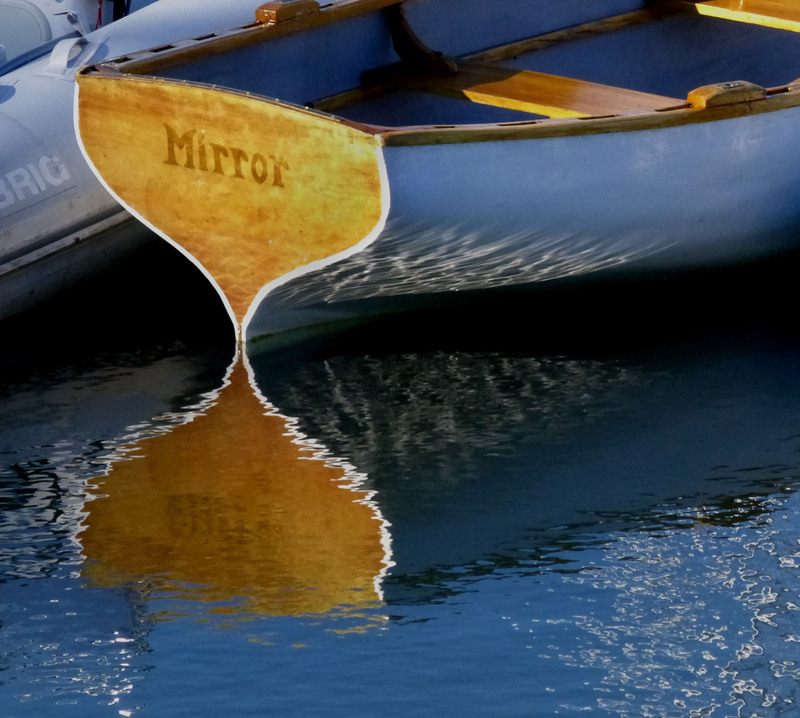 Waves and patterns of light, Jordan Pond, Acadia Natl Park. 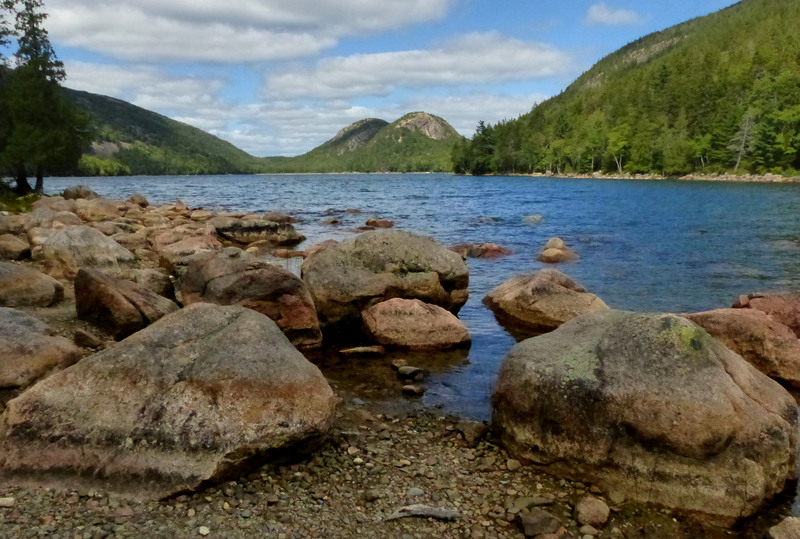 The Bubbles, Jordan Pond, Acadia Natl Park. 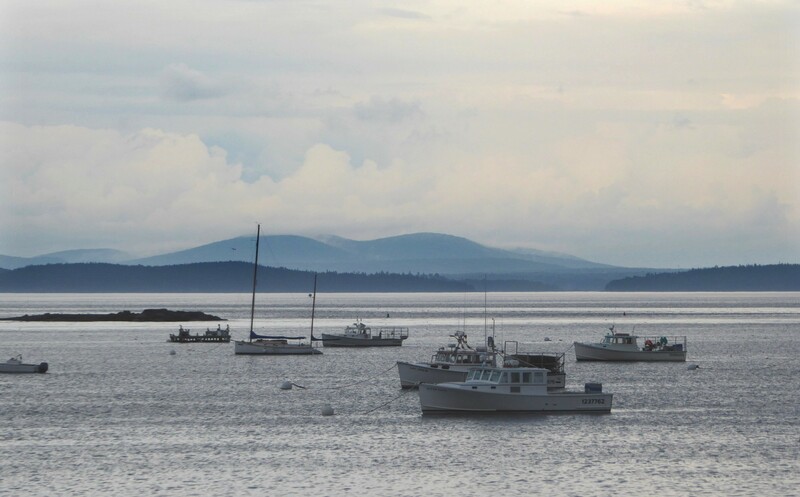 While in Maine it is hard to avoid the temptation to capture the local ambiance. This trip was no acceptation. 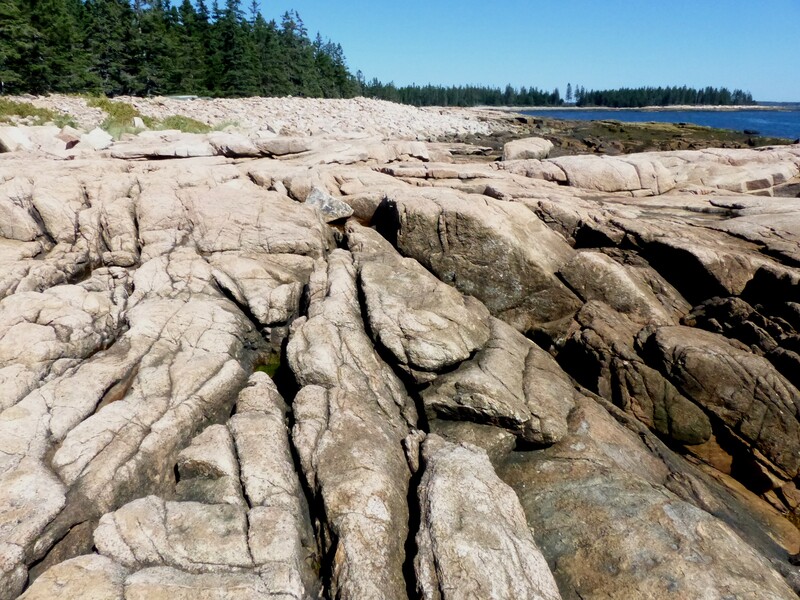 Ship Harbor Nature Trail, Acadia Natl Park. 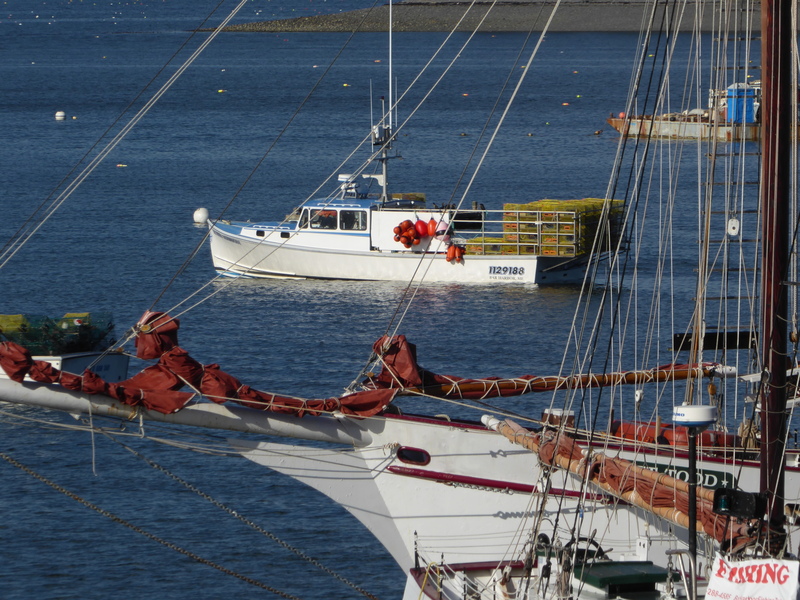 Heading out, off Bass Harbor Head. It’s probably best to consider this post as just the barest of appetizers. 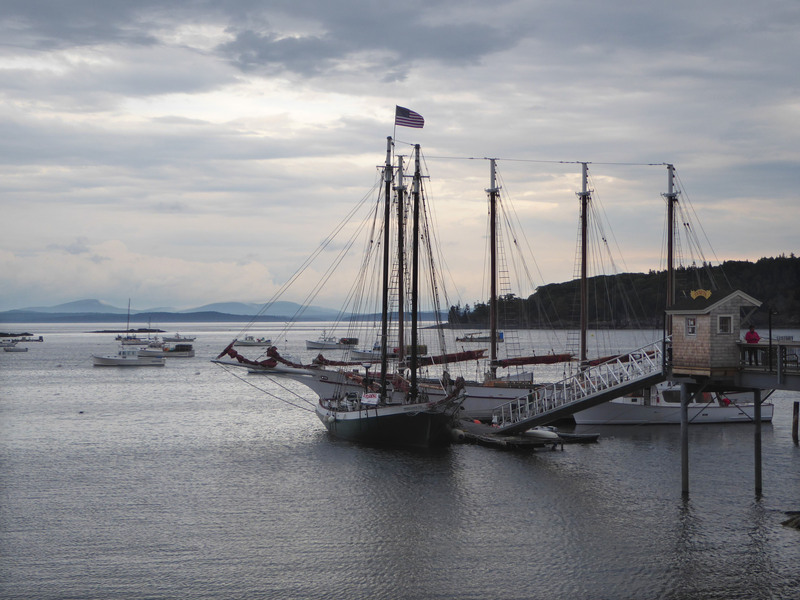 However, if you’ve never been to Maine or Acadia National Park, hopefully it has provided some encouragement to make the trip. Late August isn’t usually when I think of seeing fall warblers in central Ohio. Although I’m sure that’s the result of a certain level of ignorance on my part. So not really expecting the warblers this early, most of our efforts in recent days have been spent looking for, and enjoying, the “bugs” that currently seem to be in their prime. What started as a way to say curious during the summer doldrums has now become a real goal of our explorations. Whether a spider, butterfly, moth, bee, or dragonfly their unique beauty and behavior, so unlike our own, takes us into a truly different world. Fascinating as they are I wouldn’t want to return “in the next life” as an insect. The dragonfly is too efficient and maneuverable a flying machine bringing a quick end to anything flying nearby that it considers a meal. The life cycle of many wasps requires that caterpillars become live hosts for their larva. A convenient meal for the future wasps but undoubtedly not a pleasant experience for the caterpillar. A garden spider quickly dispatches and gift wraps a careless fly in silk for later consumption. And just when you think your the biggest, baddest, “bug” around, a bird comes along. I could go on but it is sufficient to say, it’s not for me. Praying Mantis in our backyard garden. They’ve been observed catching unsuspecting humming birds that get a little too close. A closer look, this is one insect that has no trouble holding on to it’s meal! 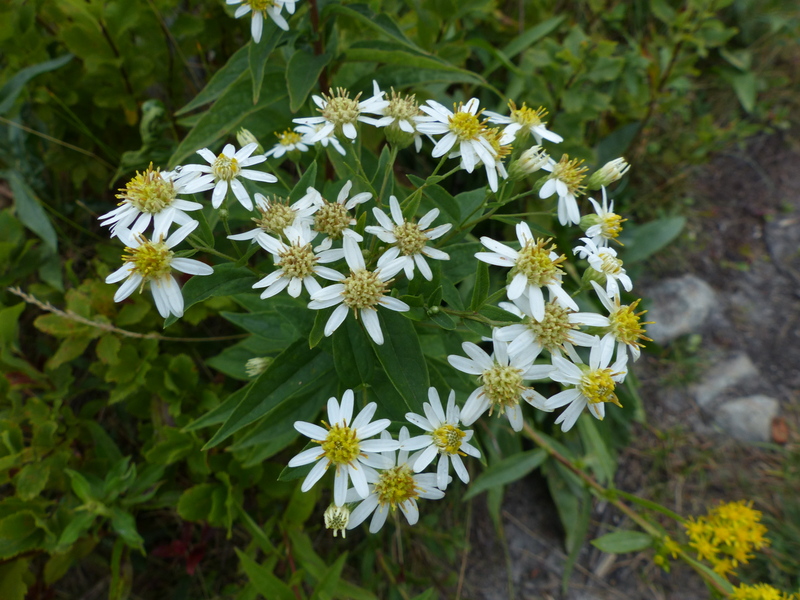 Iron weed and a Clouded Sulfur, flowers upon flowers, north end of Griggs Reservoir. Wasps making baby wasps, Prairie Oaks Metro Parks. Monarch, Prairie Oaks Metro Park. Question Mark, Prairie Oaks Metro Park. It’s not as if there haven’t been birds around. 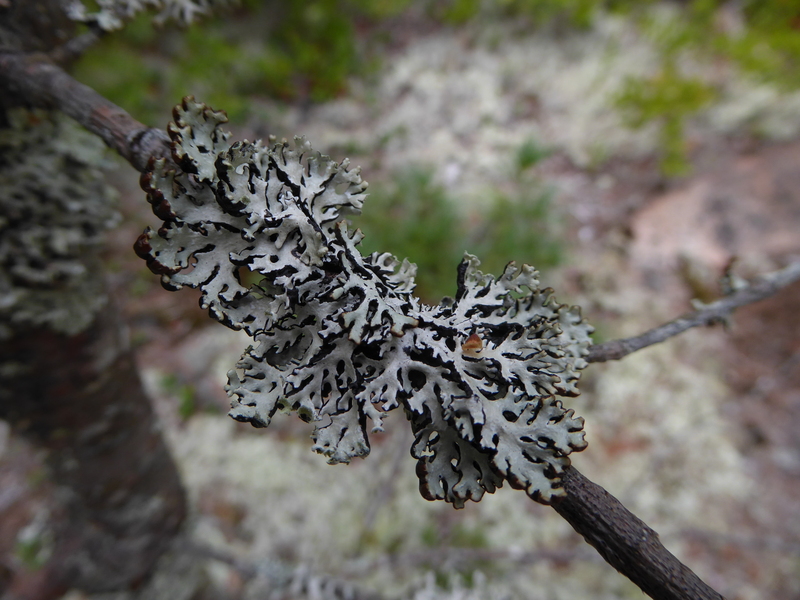 Sometimes, in our quest for insects, we get so engaged in looking down we forget to look up! 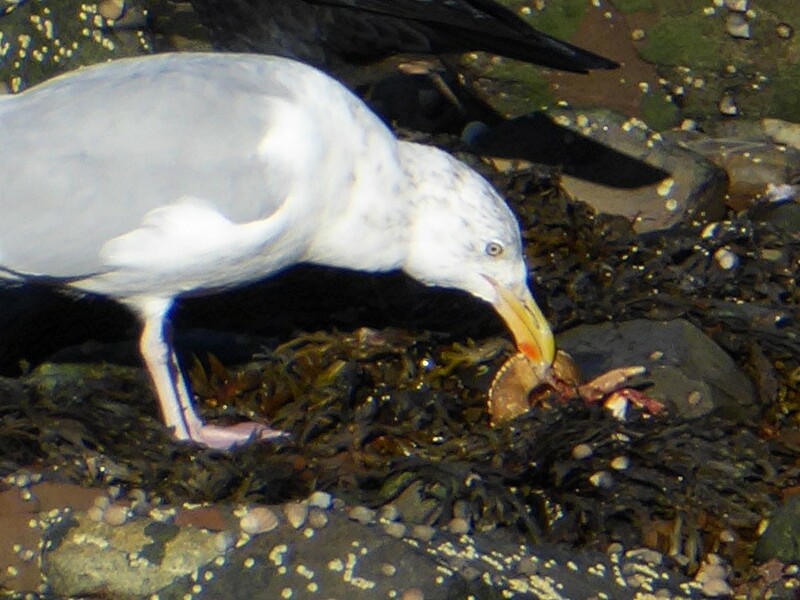 The Osprey was discovered as we were looking for warblers and provided many great poses as he devoured a fish just two of which are shown below. Osprey with fish, Kiwanis Riverway Park. 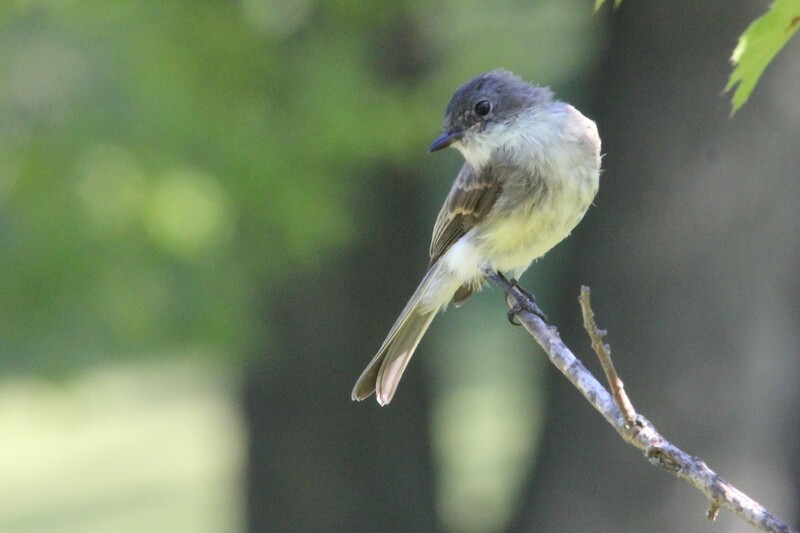 Great Crested Flycatcher, Kiwanis Riverway Park. Great Blue Heron and nest, north end of Griggs Reservoir. This is special because it’s the first nest I’ve noticed at that area in some time.
. . . and then there were the warblers, always more seen than successfully photographed. American Redstart, 1st year, Griggs Park. When in nature take a moment to enjoy the whole, allowing yourself just to be. With the fall migration just getting started we’re looking forward to what will be seen in the coming weeks. 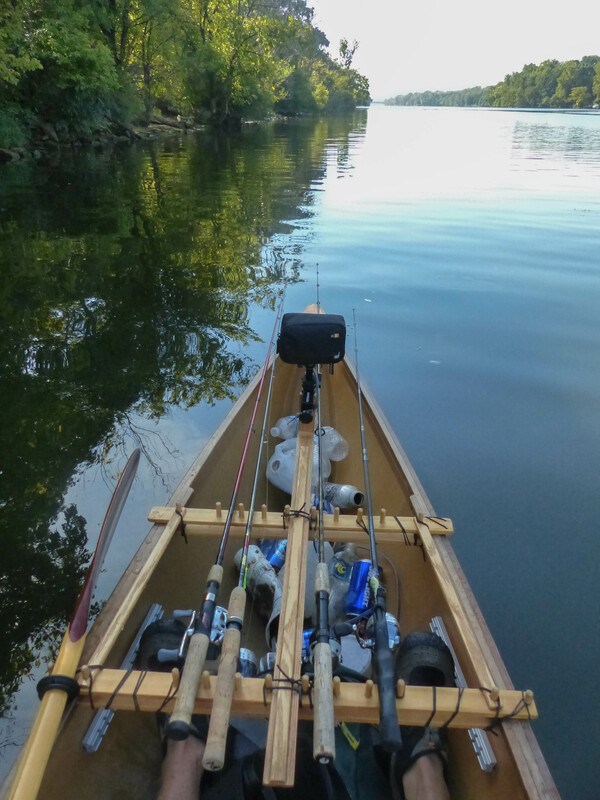 Being a lover of nature, which includes birds, insects, plants, and wildflowers, and also a person who enjoys kayak fishing, this post is hard to write. The last thing one wants to do is sound preachy and I’m also one who realizes that sometimes “___” just happens and it’s really no ones fault. 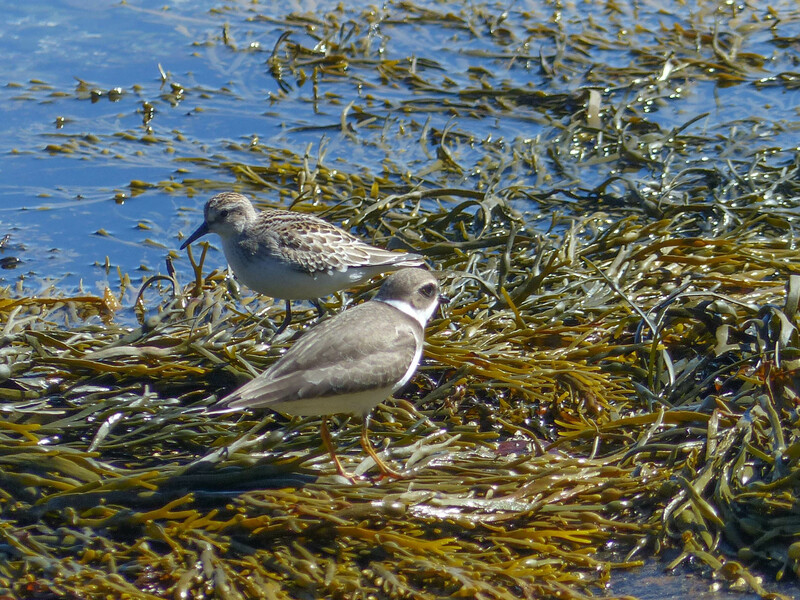 Having said that, let this post be a reminder to us all, whether birders, fishermen, or just lovers of nature, to do our best to remove fishing line, hooks, and lures from shoreline trees and bushes as well as to pick up and properly dispose of other potentially harmful and unsightly litter when we see it. 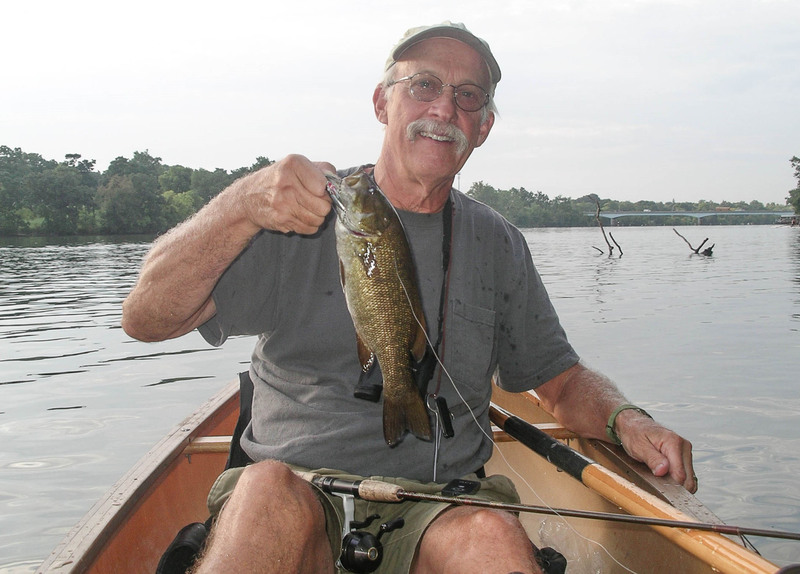 Realized that not all misplaced fishing tackle resulting from an errant cast can be recovered, this is a call to all fishermen to reduce the likelihood of a lost lure or hook by being mindful when casting, realizing that an errant cast may leave a lethal hazard in a shoreline bush or tree. 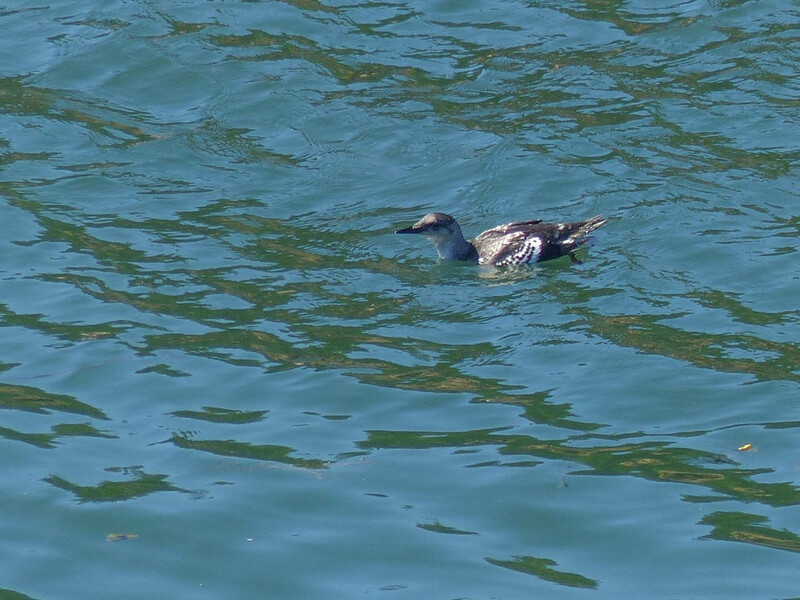 The pictures below, taken while paddling on Griggs Reservoir this morning, do not represent an isolated case. 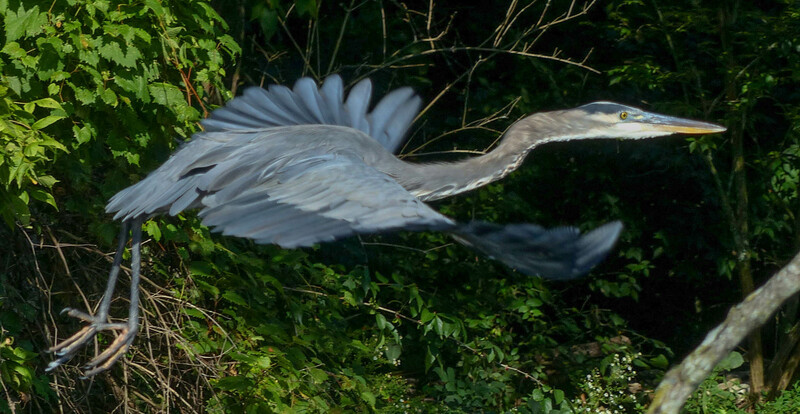 Over the years while exploring the shorelines of central Ohio’s reservoirs, my wife Donna and I have seen fishing line wrapped around their legs of herons as well as waterfowl with hooks in their bills. 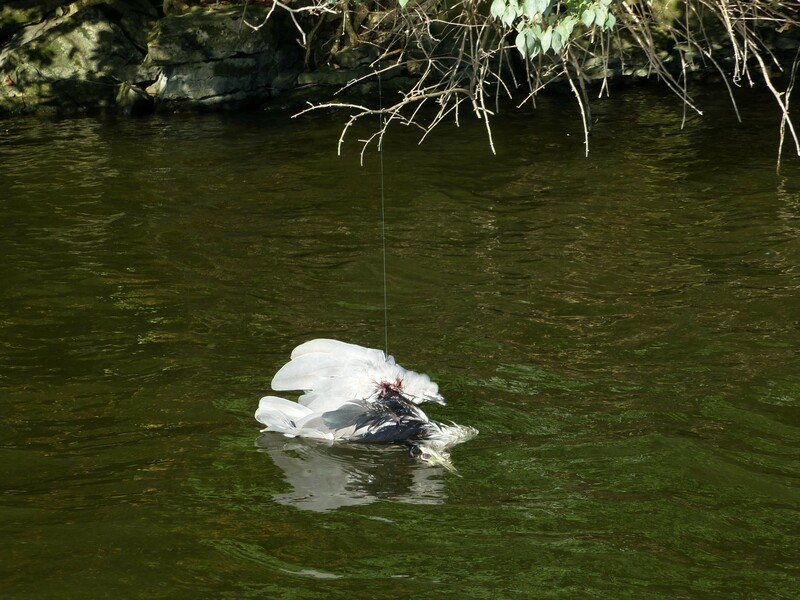 In the case below the victim was a Black-crowned Night Heron one of the unique, beautiful, and not real common, birds that call Griggs Reservoir home. 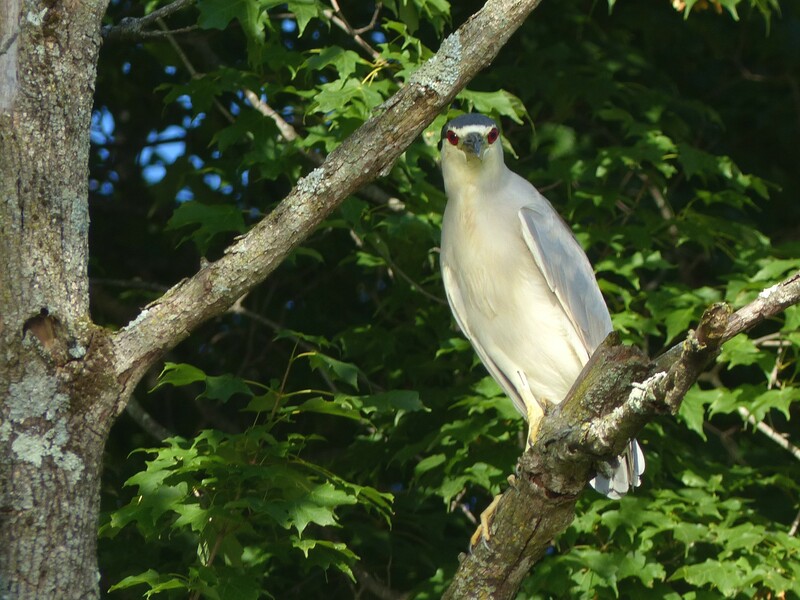 Black-crowned Night Heron along Griggs Reservoir (from a previous post). A little further north the scene wasn’t as cheerful. A special thanks to my wife Donna who took the picture at my insistence. It was not a pleasant experience for her. Not every story ends happily but some just need to be told. Thanks for stopping by. 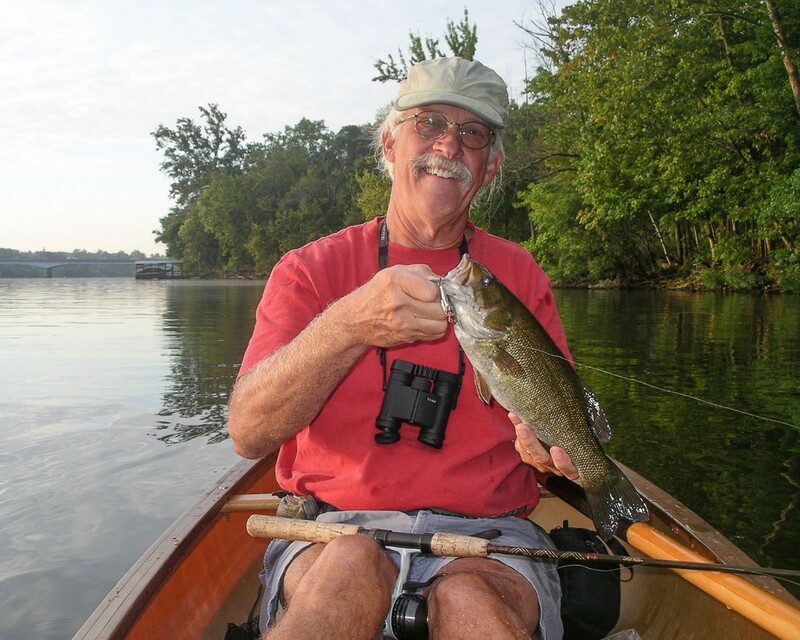 Griggs Reservoir SM Bass, released after photo. The life of an elderly Londoner and her travels.